Pedestrians cross the walkway at 16th and Chestnut Street while automobies wait for the light at rush hour. Philadelphia's roads are choking on the city's success, and right now there isn't the money or organization in place to effectively solve the problem, according to a report released Wednesday on traffic in Center City. "Today's fragmented and underfunded management is not sufficient for the task," the report from the Center City District stated. The city's population and economy, employment, and development are growing. Greater Center City, from the Delaware River to the Schuylkill, and Girard to Tasker Avenues, accounts for nearly half of the city's jobs and wage tax revenue, and almost a third of the real estate tax revenue. For the most part, the report's observations were nothing new, with many of them recently covered in public policy debates since Mayor Kenney made improving street safety an initiative of his administration: There's a lack of traffic enforcement in the city. The increase in deliveries, in part because of the explosion of online retail, is leading to more trucks blocking travel lanes. Public transportation needs to be more efficient to entice people out of their cars and ride-hailing vehicles. The report offers some sobering statistics on just how much travel through Center City has changed in recent years and what the city may have to do to keep the congestion from becoming increasingly unsafe and bad for the city's economic growth. As the city economy picks up speed, we're all moving a lot slower. The time it takes to drive between Broad Street and 23rd Street on Chestnut, Sansom, or Walnut Streets increased by 10 percent to 20 percent between 2013 to 2017. Public transportation was even worse during the same span of time, with those same trips taking 25 percent to 40 percent longer by bus. At midday, walking those Center City streets is faster than taking the bus. SEPTA is in the midst of a bus network review that could lead to an overhaul. It could be a key project in addressing the slowdown. The report notes that 50 people in a bus occupy 36 square meters of road space, while the same number of people in cars takes up 400 square meters of road. Reducing the number of bus stops, giving buses dedicated lanes, and installing traffic lights that prioritize buses all would help speed up public transit and draw people out of their cars. Truck traffic is crazy. In the middle of the 20th century, Philadelphians did a significant amount of shopping at a few big department stores. Since then, shopping has become more balkanized, with a proliferation of smaller retailers with less storage space and the need for more frequent deliveries. Meanwhile, shopping online has exploded from $4.4 billion nationally in 1999 to $111.5 billion last year, an increase of 2,400 percent. There are an estimated 18,000 deliveries a day in Philadelphia. Drivers, for a variety of reasons, park illegally while making deliveries. In one hour, surveyors counted 72 illegally parked vehicles on 81 blocks within Chestnut, Walnut, 11th, and 13th Streets. The number of tickets issued by the police districts responsible for Center City rose from 58,636 in 2013 to 77,456 in 2017. Ride-hailing helps and hurts. The report didn't have firsthand data on ride sharing's effect on traffic, but it did cite a University of California-Davis Institute of Transportation Studies study that concluded Uber and Lyft may play a role in reducing parking problems as people stop driving their own cars. But the services also draw people away from public transportation. Another study from a researcher in Denver found driving for a ride-hailing company contributed to street congestion. The city isn't adequately trying to fix its problems. "Philly has long lacked an integrated and adequately funded Department of Transportation with authority over all departments and agencies required to minimize congestion on streets," the report stated. This has been apparent in recent efforts to create bike lanes or improve traffic enforcement. The mayor's office has proposed bike lanes but cannot make them without City Council approval. Officials generally agree there needs to be more traffic enforcement in busy parts of Philadelphia, but it's unclear whether that responsibility would fall to the Philadelphia Police Department or the Philadelphia Parking Authority, which does not answer to the city. Meanwhile, there are structural problems that keep the city from making the roads easier to use. Open-ended construction permits granted to major companies make it harder to coordinate and prepare for street disruptions. Street miles resurfaced have actually gone down over the last 20 years. In 1997 the city resurfaced about 110 miles of road a year. Last year it handled not quite 60 miles. At its peak, the city resurfaced more than 180 miles of road a year. "Minimal resources are devoted in Philadelphia to the basics: maintenance of walkways and roadways, routine traffic counts and observations; diagnosis of points of congestion; systematically analyzing and calibrating on-street regulations; and evaluating impact on different modes," the report stated. The Streets Department has a capital budget of $23 million in 2018. What to do? There are solutions, but some people won't be happy about them. A big one is eliminating parking on some streets. 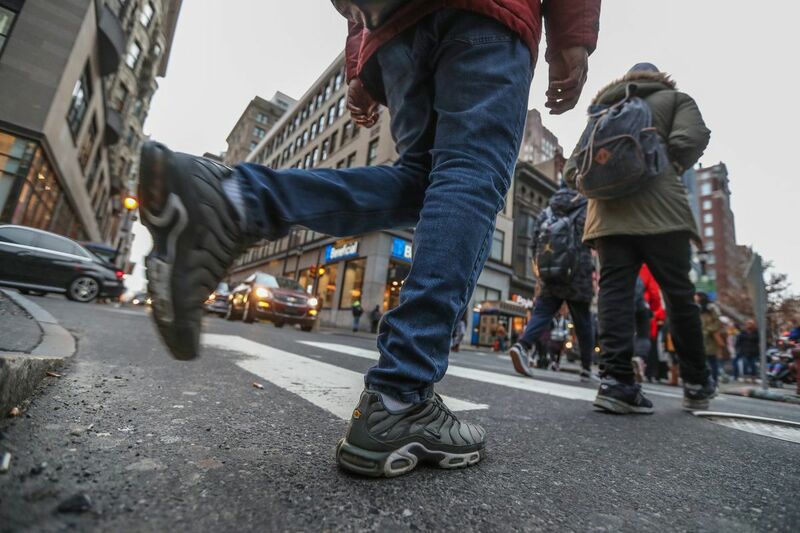 Pedestrians are a major cause of congestion, with up to 24,000 people a day on some Center City streets. People on foot block turning cars and back up streets. Turning parking lanes into turning lanes would be a big help, the report states. Other parking areas could be eliminated to create loading zones and pickup points for Uber and Lyft. The city could do a better job of coordinating utility work that requires streets to be dug up with repaving projects. The report noted other cities have used civilian traffic enforcement, something Philadelphia government is considering. More centralized control over transportation decisions would help, the report stated. Right now city bureaucrats, Council members, police, the PPA, and SEPTA all play a role. The report pointed to the PPA as a possible solution, saying the agency could expand its mandate to become more involved in enforcement and planning.